i had to go to riverside today. as long as i'm out there, i might as well hit up a car show, right? only one i could fit into my schedule was a small one, the fly and drive car show, held once a month at flabob airport. tiny little airport = tiny little show? there were maybe 30 cars there, half muscle cars, half older cars. good enough for me. had maybe 10 to 15 trophies to hand out too, as well as raffle prizes. i don't think they get too many photographers with tripods, but at least they didn't ask if i worked for a magazine. seemed like an older crowd, just more curious about me. those that did talk to me were very nice. most of them had their hoods open, and if you've been reading my blog for long, you know how i feel about that. if the owner was there, they mostly jumped right up and offered to close it for me. thanks so much! anyway, enough blathering. 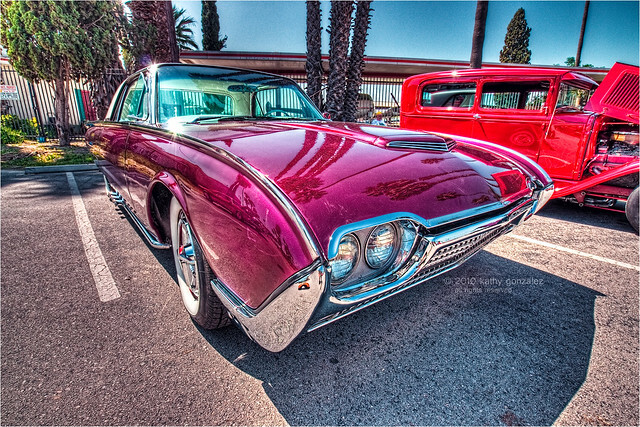 this was a gorgeous ’62 thunderbird. i believe this was the second time they had attended the show. lovely paint job. had a thunderbird ghosted on the hood, though i didn't quite pick it up in this shot. might as well have painted a target on it, as it seems the birds kept aiming at it and the owner had to wipe it off several times, which he joked about quite a bit. anyway, i hung out for about an hour or so. long enough to see who got the trophies, and this was one of them.